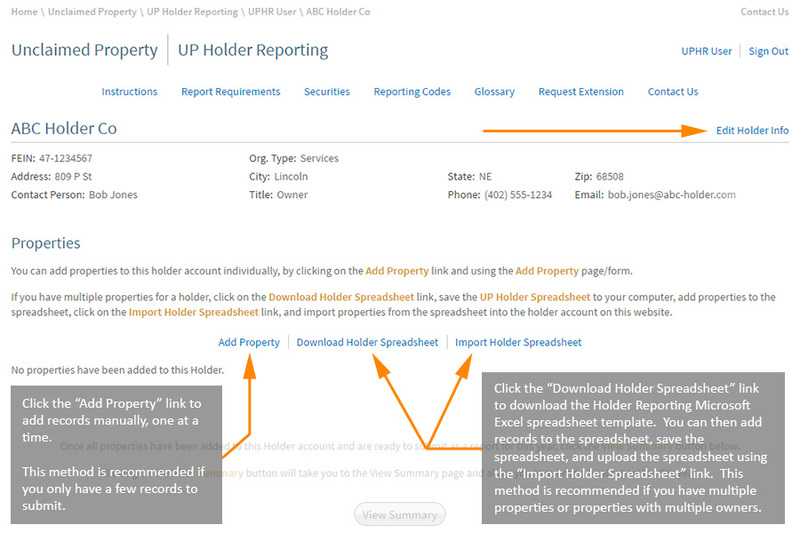 To create an Unclaimed Property Holder Reporting (UPHR) profile on the Nebraska State Treasurer's Office (NSTO) website, please follow the instructions below. 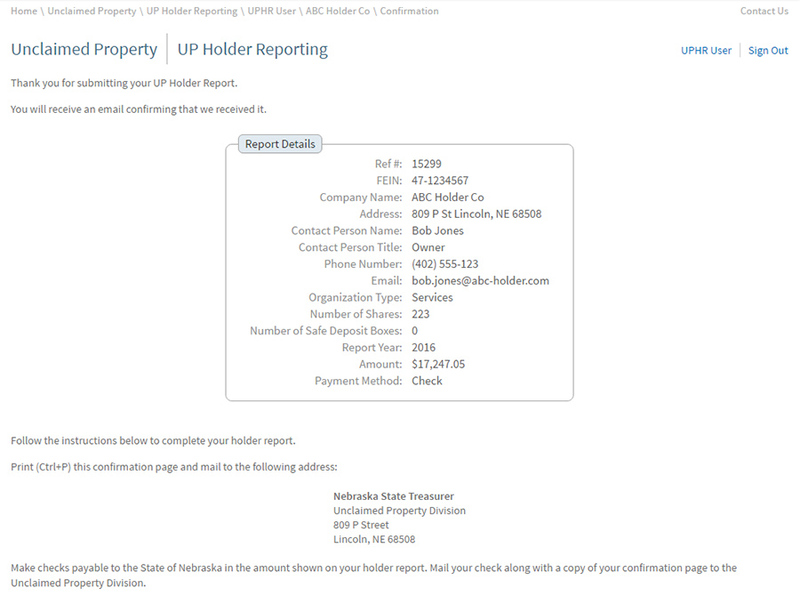 If you would like to create a UPHR profile (to report unclaimed property via the NSTO website, begin here at Step 1. Clicking on the Create Holder Reporting Account button (from Step 1) will take you to the Create Profile page. On the Create Profile page, enter your name, email address, and password you'd like to use for your UPHR profile. As you enter characters in the first password field, the criteria lines (below the password fields) will change from red to green as the required criteria are met/satisfied. When all four criteria have been met and passwords in both password fields match, the Create Profile button will become enabled. "A verification link has been sent to your email account"
"Please click on the following link to verify your email and enable your UP Holder Reporting acount:"
Click on the "Verify Email" link to verify your email address and enable/activate your UPHR profile. When you click on the "Verify Email" link, you will be redirected to the "Email Verified" page where you'll see a message indicating your email address has been verified and a "Click here to sign in" button. Click on the "Click here to sign in" button. Once you have verified your email address and enabled/activated your UPHR profile (as instructed in Step 3), sign into the UPHR section of the NSTO site using the email address and password you used to create your UPHR profile in Step 2 on the NSTO UPHR page. When you sign in, you'll be redirected to your NSTO UPHR profile page. To add a holder account to your UPHR profile (from the UPHR Profile page), click on the Add Holder link just above the Holders table. If you are a bank you may create a separate holder for each branch if you choose to. If you are a parent company, you may create a separate holder for each subsidiary you need to report on behalf of. Enter your holder information. If you have more than one holder to enter, click the Submit & Add Another link. Once all of the information is entered, click the Submit & Close link. 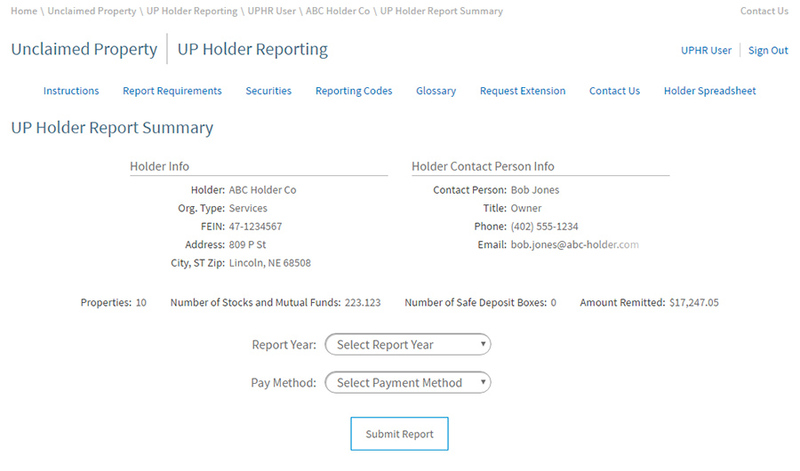 Holder accounts you create will be listed in the Holders table on your UPHR Profile page. The next step is to add the properties you have to a holder you've created. Click on the holder account name to add properties to a that holder. From the Holder page, you can edit holder information by clicking the Edit Holder Info link and/or add properties to a specific holder by using the Add Property, Download Holder Spreadsheet, and/or Import Holder Spreadsheet links. You can add a property or multiple properties to a holder account using either method (the Add Property page and/or the Holder Spreadsheet). The Add Property page is recommended for adding a single property (or possibly a couple of properties). The Holder Spreadsheet is recommended for multiple properties. The View Summary button becomes enabled once you've added one or more properties to a holder account. Clicking on the Add Property link on the Holder page will take you to the Add Property page. 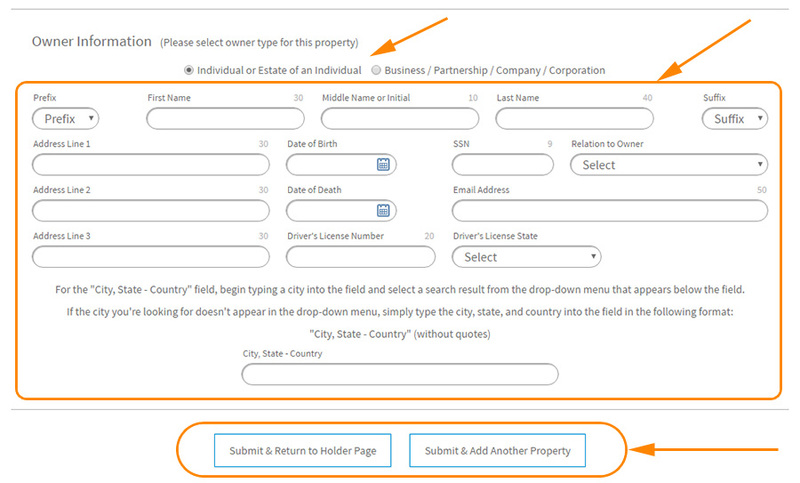 On the Add Property page, you will see the "Property Information" section fields initially. You'll need to select the owner type (via radio buttons at bottom of page) to display the "Owner Information" section fields. Once you select an owner type, the "Owner Information" section fields and Submit buttons will be displayed as well. Once you've entered the property and owner information, you can click on the Submit & Return to Holder Page button or the Submit & Add Another Property button. 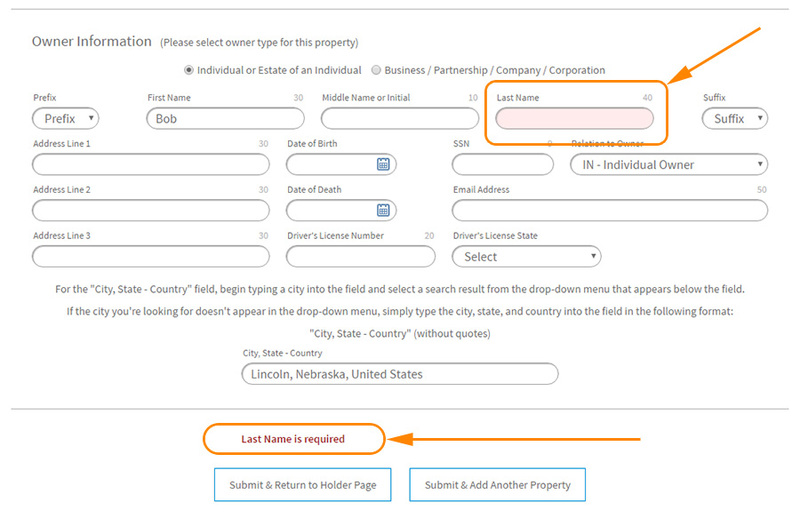 The Add Property page will notify you if there any errors on the page when you click on one of the Submit buttons by displaying an error message at the bottom of the page and highlighting the field or fields where the error or errors exist by changing the background color of the field(s) to a light red color (as shown below). 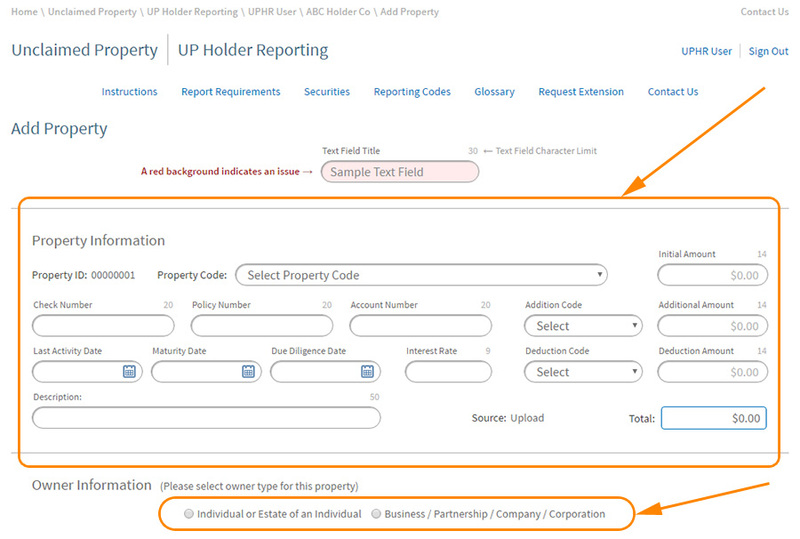 If you have multiple properties to add to a holder account, we recommend using the Holder Spreadsheet. 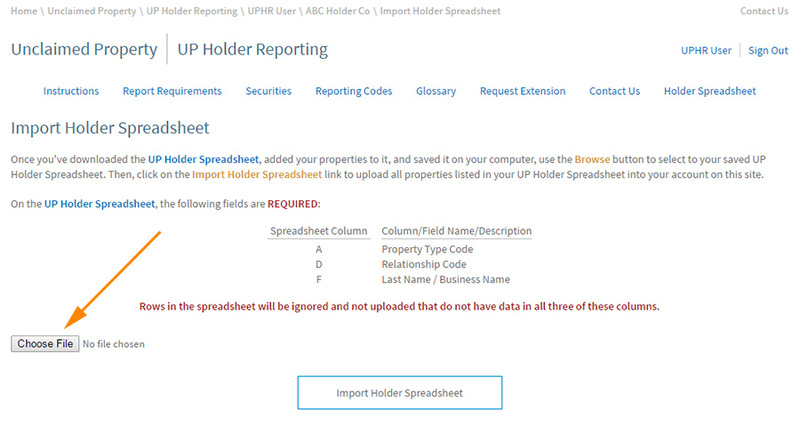 Once you've downloaded the Holder Spreadsheet, enter your property information into the spreadsheet following the instructions, codes, and sample data provided in the different sheets (tabs at bottom of spreadsheet) included within the Holder Spreadsheet. 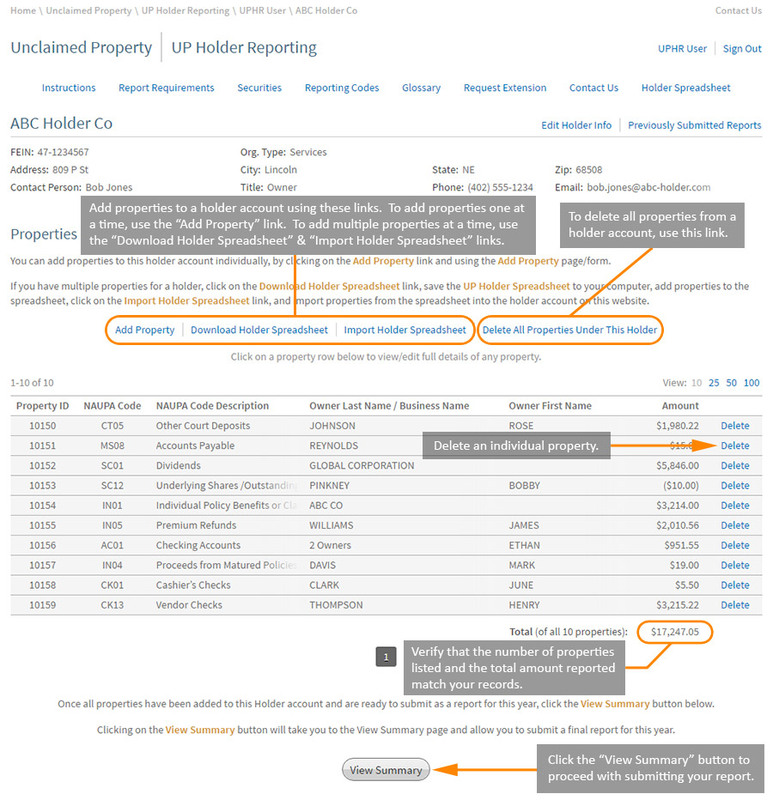 You can find a list of accepted Reporting Codes on the Treasurer's Unclaimed Property Holder Reporting Reporting Codes page. 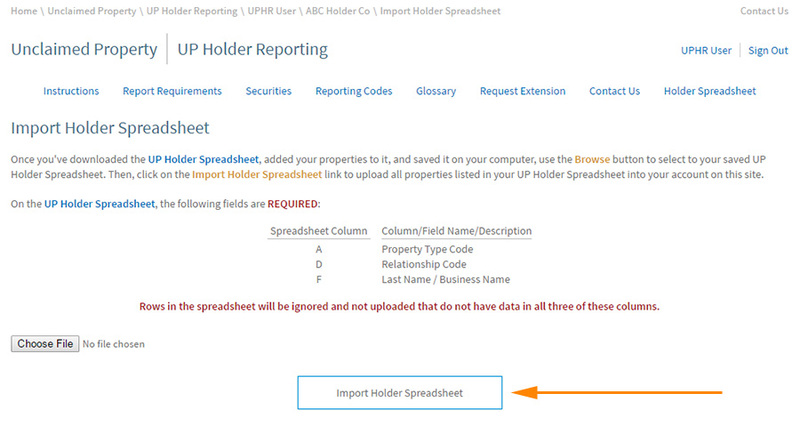 If there are errors in the information you've entered for your properties in your Holder Spreadsheet, you will be notified by one or more error notification lines a the bottom of the "Import Holder Spreadsheet" page, below the Import Holder Spreadsheet button. These error notification lines will indicate specific issues with the information entered in your spreadsheet. If you have errors in the information in your spreadsheet, correct the issues with the information in your spreadsheet, browse to your spreadsheet file, and click on the Import Holder Spreadsheet button again, until you no longer have any errors and are able to successfully import your spreadsheet. You will see a confirmation message when your properties from your spreadsheet have been imported and "Click here to return to your holder page" button. 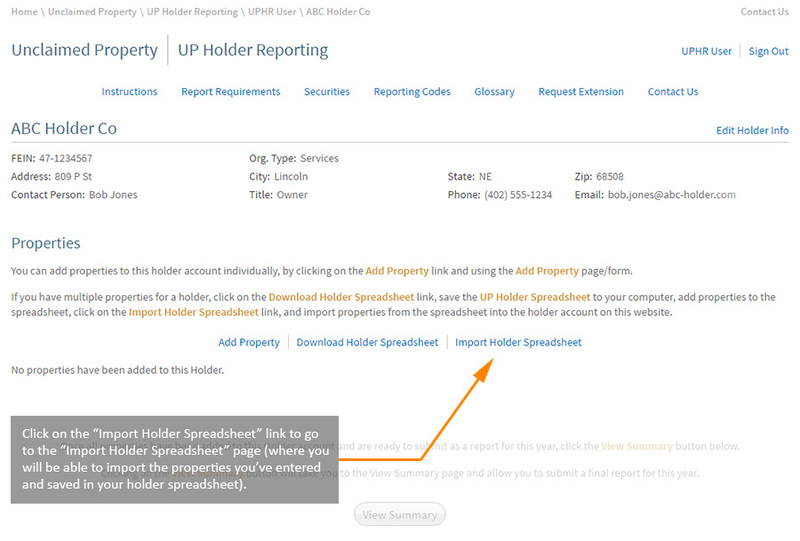 Click on this button to return to your holder page for the holder account you've just imported your properties to. 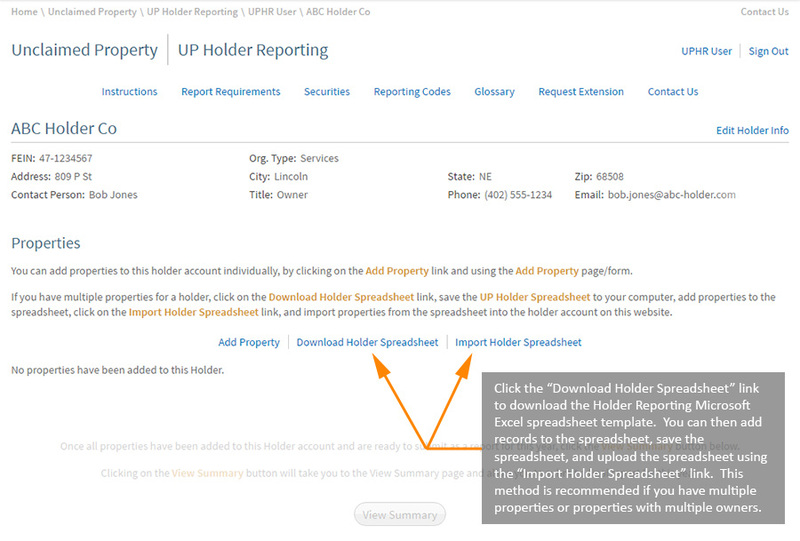 From the Holder page, you can edit holder account info, add properties to a holder account (individually or multiple properties at a time via the holder spreadsheet), delete properties from a holder account (individually or all at once), and click on the View Summary button to view the summary of all properties you'd like to submit for a report. From the Summary page, verify all holder report summary information is correct, select the report year and pay method and submit your report by clicking on the "Submit Report" button. ACH payments may be submitted through your bank. We do not accept payments through our website. Contact Us for ACH payment instructions. The Confirmation page confirms your report has been successfully submitted. Print the confirmation page and mail it in with your check for the amount listed in the details.